Log siding from ABC Seamless of Albuquerque is the perfect cladding material for homeowners in Placitas, New Mexico, and the surrounding areas, who have been looking for a realistic wood look without the maintenance. 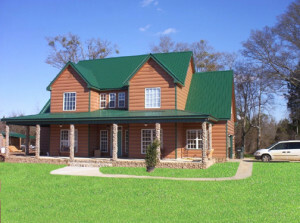 This highly durable product will provide the log cabin look you were searching for and includes all the great benefits of our signature seamless steel siding, which means it will never warp, rot, crack, fade, or peel, unlike regular wood. Additionally, purchasing your log siding from ABC Seamless of Albuquerque will grant you the best energy efficiency available in the area. Our cladding is crafted with foam-backed insulation that will reduce the transfer of heat into and out of your home. This insulation will lead to less stress being put on your HVAC system and could even save you money on your monthly energy bill. For more information about the beautiful log siding that can be installed on your home in Placitas, NM, or a surrounding area, contact ABC Seamless of Albuquerque. Alternatively, feel free to stop by our massive showroom, which is open Monday through Friday, to see all of our cladding products in person.